Provide Multiple Preview Modes: Hex View, HTML View, RTF View, etc. Support MBOX/MBS/MBX Files of Thunderbird, Entourage, Opera Mail, etc. 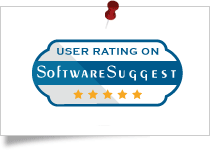 Software Informer gives SysTools Gmail MBOX Viewer Free Software a 100% secure and clean award for its best performance and feature-rich nature. SysTools MBOX Reader software to view MBOX file gets 100% clean award by Softpedia for delivering Ad/Virus/Spyware free solution. SysTools MBOX File Opener to read mail from MBOX file got the 4-star rating from Cnet for its efficiency and easy-to-use interface. 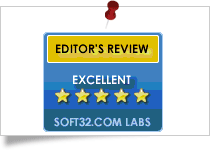 Soft32 provides SysTools Thunderbird MBOX Viewer Software a 5-star rating for being the most effective product for opening MBOX files with attachments. 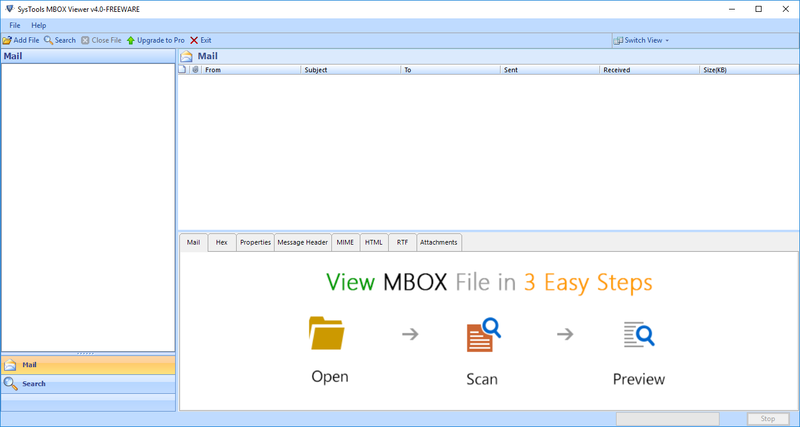 SysTools MBOX Reader to read Mail MBOX is the recommended Forensic MBOX Mail Viewer software to open large MBOX file among various others as it has the best performance for opening MBOX files. SysTools MBOX Viewer is a smart utility to open and read MBOX/MBX/MBS files without the installation of the email client. The tool provides different view modes which made it easy for me to view MBOX files in Hex View, RTF View, Attachments View, Properties View, etc. Moreover, the user interface of the software is very amazing and easy-to-use. I need to open and read orphan Thunderbird MBOX files. SysTools MBOX Viewer made it possible for me. Without any email client installation, I was able to open MBOX files in just a few clicks via the tool. Thanks for introducing such a beneficial utility. With SysTools MBOX Viewer, it is possible to search for a particular MBOX file among various MBOX files with Advanced Search option. Moreover, one can also save the search results in PDF format via the tool. Advance Search: This feature permits the user to search for a specific MBOX file among tons of MBOX files in a hassle-free way. To make the search process more specific, the user can make use of filters and operators. Export to PDF: Sometimes, the need arises to save MBOX files into PDF format. For example, Forensic Examiner who deals with MBOX files to carve evidence has to present evidence in PDF format in court. So, one can easily export MBOX files into PDF via the software. Mail View: View Path, From, Cc, Bcc, Subject, etc. Hex View: Shows MBOX emails in Hex Code. Properties View: Display Message Class, Size, Date, etc. Message Header View: Show message header of MBOX email with all the details. MIME View: View MIME-Version, Content-Type, X-Priority, etc. HTML View: Display MBOX emails in HTML format with all the tags. RTF View: Show MBOX message in plain text format. Attachments: Preview attachments associated with MBOX emails. With MBOX Viewer utility developed by SysTools, the user can open and read MBOX file emails with proper formatting. Moreover, the software permits the user to view MBOX emails along with the attributes associated with it such as From, Subject, To, Sent date, Received Data, Size in Bytes. The MBOX Reader tool is capable to open and read MBOX fie emails along with the attachments associated with it. Moreover, one can easily preview the attachments of the selected email via the Attachments Preview Mode directly from the software’s interface. File Mode: This option allows users to add & preview single MBOX file. Folder Mode: This option allows users to browse the folder consisting of multiple MBOX File & preview in bulk. The software permits the user to open and view various MBOX files in a batch. One can easily explore multiple MBOX files via the tool without any email client installation. One can easily open MBOX file emails in two different modes. The software allows the user to read MBOX files in horizontal view mode as well as vertical view mode. One can select any view modes as per the convenience to read MBOX files. 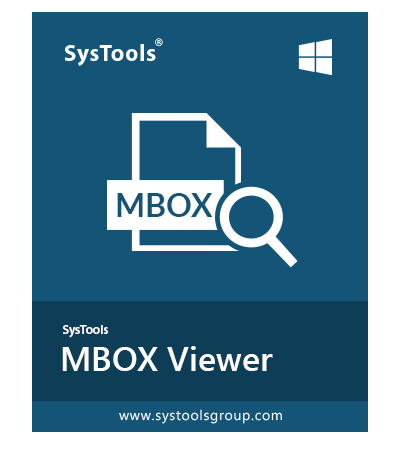 SysTools MBOX Viewer is designed with advanced algorithms which makes hassle-free for the users to read MBOX emails without installation of any email client. 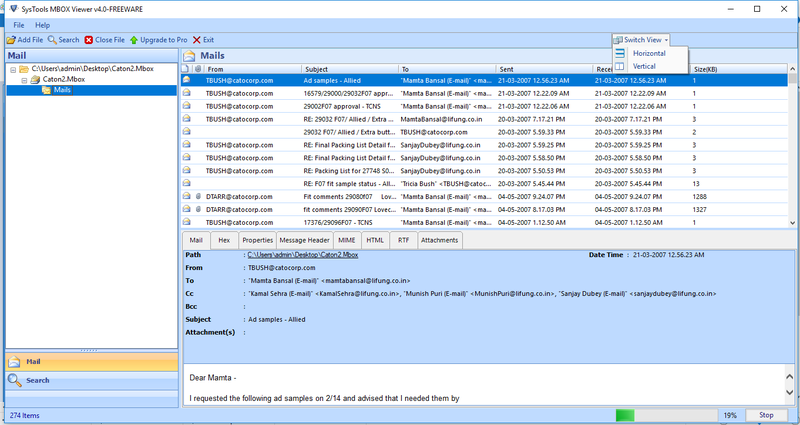 The software is capable to open MBOX/MBX/MBS files of multiple email clients. The software is having a user-friendly interface due to which users can work with it without any problems. It is trouble-free for both technocrats and tyro users to operate and work with the tool to open and view MBOX files. MBOX File Reader performs a quick scanning of each .mbox file & lists all of its emails with proper folder structure. This Thunderbird MBOX File Viewer will preview scanning process with file size & creation date. The SysTools MBOX File Viewer does not have any limitations on the file size of MBOX File. 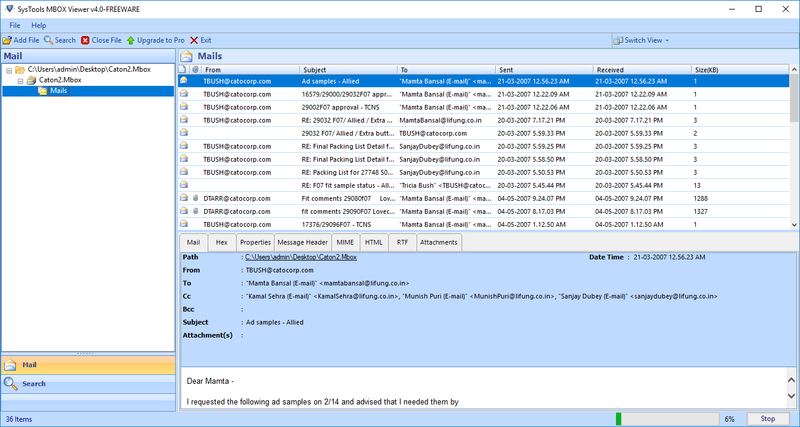 This Thunderbird Email Viewer allows you to read MBOX file of any size and view them successfully in MBOX Opener Software. The SysTools MBOX Viewer Pro software will scan, load and ask to Index the entire MBOX file items. The user can allow Forensic MBOX File Viewer software to index the MBOX file items to later search for email within the MBOX file. One can easily scan and preview multiple MBOX files via the software. The user can easily browse and open MBOX files individually i.e. one after other. The software will load each MBOX files and one can also get an idea about the MBOX files item count via the tool. The software makes it easy for the user to search for a specific MBOX email by providing Advanced Search feature. The user just has to enter the relevant word or phrase in the search bar. The software will display all the emails related to the keyword searched. One can also customize the search process by using search filters and operators. One can save selected MBOX emails or the entire MBOX file along with the attachment in PDF format via the software. The software maintains the formatting of MBOX emails while exporting them into PDF format. After the conversion, the user can easily open MBOX emails with attachments in PDF. While saving MBOX files into PDF format, the user can make use of different naming patterns provided by SysTools MBOX Viewer Pro tool. One can save PDF file by subject, date, auto incremental option, etc. The user can also name the resultant PDF by providing the name of his/her own choice. The software also allows the user to save the PDF file at any desirable location on the user’s system. Moreover, one also create a new folder using the MBOX File Viewer software directly from the software interface to save the resultant PDF file. 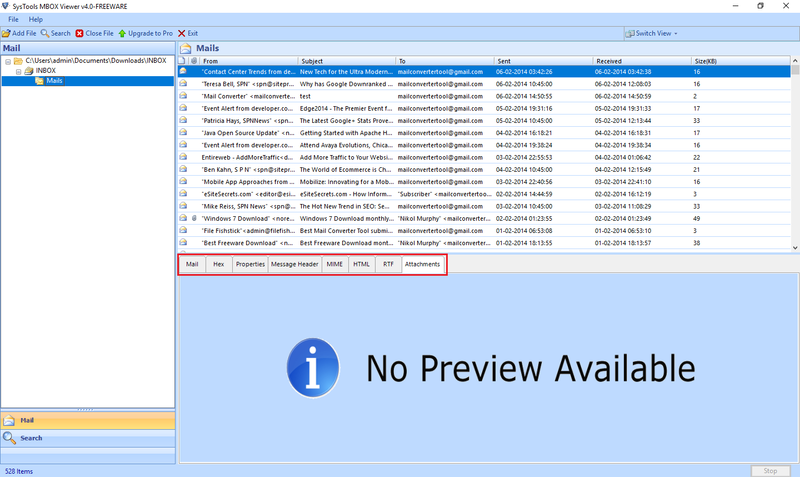 Free version of SysTools MBOX Viewer Tool only preview all Emails with Attachments. 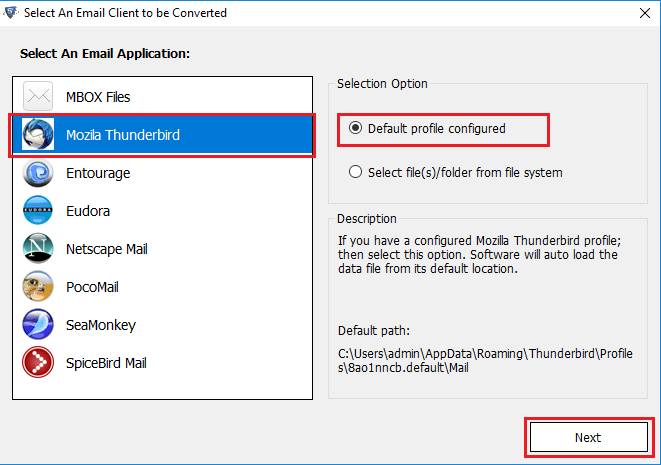 How to view Thunderbird’s MBOX File via SysTools MBOX Viewer tool? Can I open and view MBOX files on Windows 10 machine? Yes, the user can read MBOX files using SysTools MBOX Viewer on Windows Operating system irrespective of the Window’s version. Is it possible to add multiple MBOX at once? Yes, the user can add multiple MBOX files at once via the SysTools MBOX Reader software. One just needs to select Add Folder option and the software will load all the content associated with MBOX file. Does the software work with MBX/MBS files also? Yes, the software is capable to open and read MBX/MBS files also. Do I need to install any email application to use SysTools MBOX Viewer software? No, you do not need to install any email application to open and view MBOX/MBS/MBX files via the software. The MBOX Viewer is capable to open MBOX files without any email client dependency. Can I open and read corrupt MBOX files using the tool? Yes, you can open and view corrupt MBOX files via the MBOX Reader tool. Does the software permits to analyze MBOX files in a proper way? Yes, the software provides different preview modes to view MBOX file emails with all the attributes associated with it. 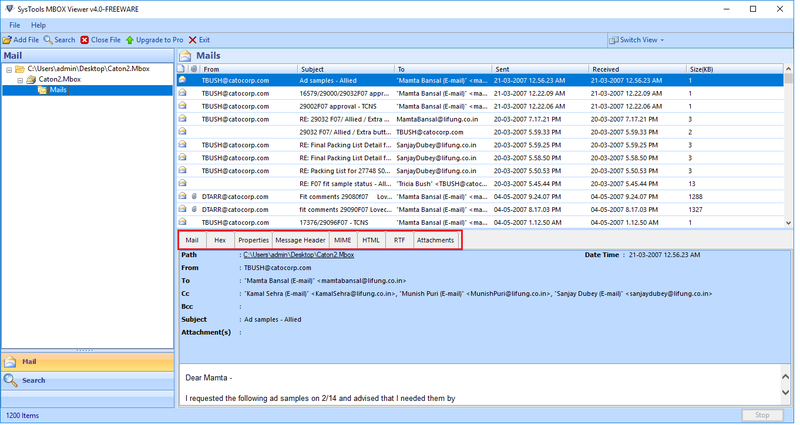 To read MBOX file emails with various details, one can open MBOX file via Hex View, Properties View, HTML View, RTF View, Message Header View, etc. Are there any data security issues associated with the software? No, the software is integrated with powerful security and data protection algorithms. So, there is no chance of the security breach or data loss while working with the software. Can I view attachments associated with MBOX emails via the tool? 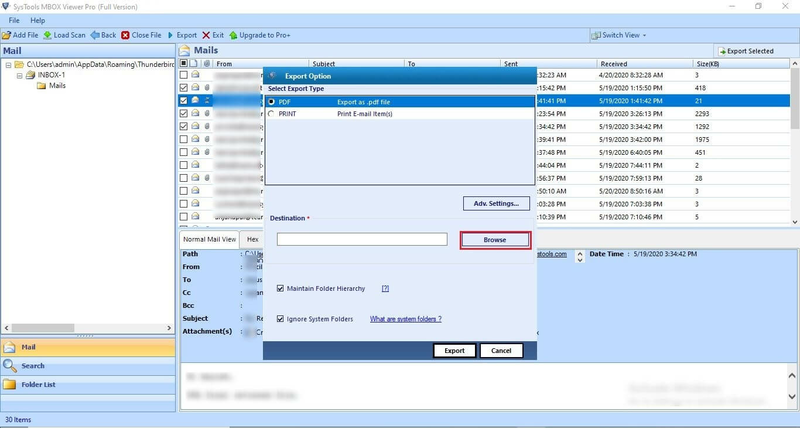 Yes, the SysTools MBOX Viewer allows the user to open and view MBOX file emails along with the attachments. The user can view different types of attachments via the software such as text, document, image, etc. Can I search for a particular MBOX email among numerous MBOX email files? Yes, the user can search for a specific MBOX email by using the Advanced Search Feature provided by the software. To avail Advanced Search feature, the user needs to upgrade to SysTools MBOX Viewer Pro version. One of my clients shared the MBOX file with me to view some data from it. But, I was not having email client supporting MBOX file installed on my system. Then, after researching on the Internet, I got to know about SysTools MBOX Viewer. With this utility, I was able to open and view MBOX files in a seamless manner. Moreover, the user-interface and performance-rich nature of the software is very impressive. The speed and the features associated with MBOX Viewer Tool is just amazing. One can easily open and read MBOX files via the tool. The software provides a wide range of features which makes it hassle-free for the user to work with MBOX files. Thanks for developing such amazing software. Some of the orphan MBOX files were stored on my system and I wanted to open and view those files without any email client installation. I was not able to find a simple and reliable way to open and view orphan MBOX files without any email client. Then one of my friends suggested me SysTools MBOX Viewer and this tool worked like magic. I was able to read MBOX files using the software in just a few clicks. SysTools MBOX Viewer is a brilliant utility to open and view MBOX files without any email client dependency. The software is integrated with amazing features such as view MBOX emails along with attachments, easy-to-use interface, multiple preview modes, etc.